This product requires the base game The Incredible Adventures of Van Helsing II. What is this strange creature? A pig who can fly? A flying machine that looks like a pig? It doesn’t matter, really: the Pigasus is the true wonder of weird science, created to explore the depths of the murky Otherworld (better known as the Ink) – and retrieve information from the world beyond, not to mention the large amounts of extremely rare artifacts. Spend some precious Essence, summon this strange creature to your Lair… and buy some rare new items from the Pigasus! 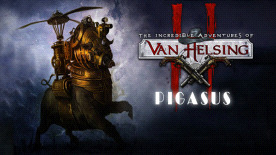 The Incredible Adventures of Van Helsing II is required to play this DLC.